I love it saves my eyes and is so convenient and terrific! Can't wait to see how these will work. I am a bit disappointed I won't be able to use some types of embroidery threads as they would be too thick for the eyes. Great even if you CAN see! I saved a few for me and gave the others away to friends that have trouble seeing 'small' items like the threading holes in needles. Perfectly easy to use and store. Great product. I bought two packets, one as a gift for a 92 year old woman and one for myself. There was far more needles than either of us needed but they are a great idea. Only tested one and it was slightly difficult to get thread down but it is still much better than trying to thread an eye by sight. Just after I received these, I had occasion to use them. They are so easy to use. I love them. Its so easy to thread a needle. I just got frustrated threading needles because my eyes aren't as good as years ago. I used this for a quick fix and I threaded it easy enough, but at one point I had to rethread it. As a recent widower and 75 years old I have had to do somethings for my self. Sewing on a button is one thing I can now do for myself and not have to ask my daughter. I was so frustrated trying to use flimsy needle threaders and I was totally unable to thread a needle without aid. These needles are incredibly easy to use and certainly solved my mending problems. At my age, my eyesight is not what it used to be. With these needles, I no longer experience the frustration of threading a needle. The needles are very easy to use and the thread stays in the needle. When I use all the needles I received, I will definitely restock. My wife is a quilter and lost about 80% of her sight due to Glaucoma. With this product she is able to thread her own needles without my help. what a life saver ! a needle, but these are so easy to use. I have very poor eyesight and had to stop sewing as a result. This product has allowed me to resume my love for sewing. I Love it!! I make quilts to give away and use for myself. As I get older my eyesight isn't a good as it use to be so threading a needle was a problem for me. I found these self threaders and love them. Now I'm back sewing and enjoying my projects once again. Excellent for people who have trouble threading a needle. These needles are life savers! No cons, just perfect! I no longer dead having to thread a needle. Quick to use. Wonderful when the eyes go. I have tremor and weak eyesight, so these are a necessity. These needles are great to use if you have trouble seeing the eye to thread a needle...or if you have a young seamstress who has difficulty hitting the eye. The thread slips right in. I am older...but still like to do cross stitch and regular sewing, and these are perfect for me. I bought some for my sister who has limited vision and they also work for her. I use these for mending and basting. I had issues with spiral eye needles as the thread kept poping out. I don't have that issue with these. I really love these easy-to-thread needles! Where have they been all my life? Great and easy to use. As I get older, I find it more difficult to thread needles with my arthritic hands and myopic eyes. This product solved the problem. Just a quick "snap" and the needle is threaded. And the thread doesn't pull out, even when you tug hard to get the needle through the fabric. What a great idea! Easy to Use and Saves Time for me. I like a variety on tools in my sewing box.self threading needles are very handy in many situations that come up unexpectedly. Fluffy threads that won't make a point to go through a regular needle thread promptly, good for hiding short little threads to make your work look nice and neat. . . What ever comes up that needs special care. Be sure to use a thimble for regular sewing because the threading end has a sharp point. Every now and then thread comes out if needle is pulled wrong way, but it slips right back in to continue, so minimal concern. Awesome product for someone who has trouble threading a needle (in my case, when I can't find my glasses), or just wants to make the job easier. The older one gets the harder it is to see the little hole in a needle, but you still need to repair the little hole in your sock. Thank goodness someone thought of giving me a needle that puts the thread in the hole with ease! Easy to thread. No more needle threader needed. A must for anyone with vision problems. Never have to find the eye of the needle again. Just hold the thread over the center groove and pull down and the needle is threaded. I don't have to strand my eyes any more to thread the needle very helpful. this is one of those things that just makes so much sense, it's a wonder it hasn't bee around longer!. I have been looking for self threading needles for some time. The pleasure of needle crafts have been put aside due to my difficulty in threading the needle. I could hardly wait to get the self threading needles. They are great and there is an abundance of them. Different sizes will be a help too. Thank you so much for providing this product. I have not used these yet, but they have to work great. I recently purchased a self-threading sewing machine, because the old eyes are not what they used to be. I was glad to find these. Most of my sewing is for small repairs or sewing on patches which requires frequent thread color changes. Really nice to be able to 'thread' the needle in poor lighting because you really don't need to see it to pop the thread in. Have trouble threading needles even with reading glasses on. These are perfect and just what I needed. I've looked for several years for these! The first set I received years ago from a friend. But over the years I lost some, and gave some away. I looked everywhere for them to buy but to no avail until now. At last I was rewarded for my efforts! I now have 2 sets to use or to give some away if I chose, but you can bet I'll keep most of them for myself. I love them. My friend knew me well when she gave me some, and they were the greatest gift I ever received from a friend. I would by these anytime. i love how easy these are to use. It is hard for me to see regular needles but these make sewing easy. I will use them often. these needles will solve a very frustrating problem for me because of failing eyesight. Perfect for those having trouble threading needles. This needle took a few trys to get the 'hang' of it, but after I figured out how to hold it and get the thread popped thru the eye - without sticking myself - mending was as it used to be. You know, before my eyes got 'older'. Now I have thrown out all my other needles because they won't be used. I would love it if it came with a small container to keep up with the needles. This is a great product! My mother, who is 83, has no trouble now threading a needle. I like the self-threading needles, too. I love these. You don't even have to look when threading. I had guest over for dinner & the subject came up about my sewing, you see I haven't been doing much sew lately because of my bad eye sight & I showed my guest my new self threading needles & needless to say they loved them too. I had to give them a couple of the needles,but that's okay because there's 48 of them so I had a few to spare. 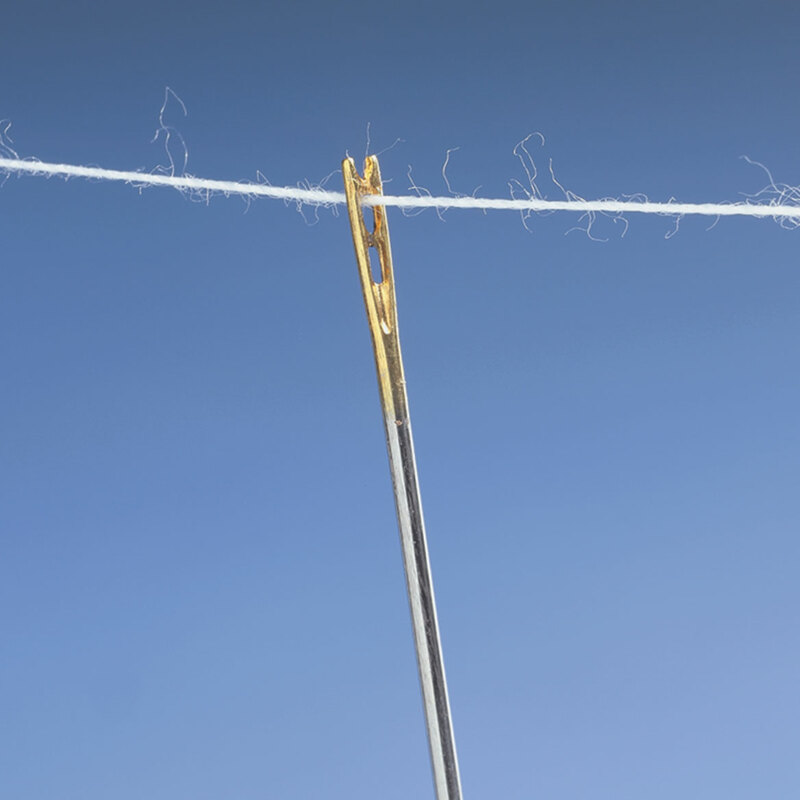 This makes any sting project much simpler...no struggling to thread a needle. As one gets older products like these self threading needles make life much easier. Why Didn't They Think of this Years Ago? You can thread a needle on 1 try! I bought a pack for myself & others as gifts. I wish I would have bought more while they were on sale. These needles are easier to thread than having to put the thread thru the tiny hole atop a regular needle. As long as you have somewhere to balance the needle so you can pull down on each side of the thread to "pop" it into place. I do like using these needles for mending & hemming. I haven't had an occasion to use these yet, but I'm sure I will appreciate them when I do. Enough needles to last a lifetime! You don't need the eyesight of a 20 something to thread your needle. These are very easy to use and work well. No glasses or extra light needed. Love the product and have bought some for gifts. Great! I just wish they were thinner. I have a very difficult time threading a needle and these have been great. Haven't had time to try them out but am pleased at the prospect of not having difficulty threading needles with small eyes. Liked the idea so well I bought 3. At 60 I have trouble threading a needle so I guessed that my mom and stepmom also had same problem. RIGHT ON!!! THEY LOVED THEM!!!!! I have had difficulty for years in threading a needle, and this item solved my problems. It should be on everyone's list for Christmas. Just use it as you would a regular needle. Package needs to have larger needles! Great for handsewing which I do. With failing eyesight and limited lighting I am sure these will be great for me. Great Idea but need better quality. I've used the product several times and found I still have trouble lining up thread over top of needle without squinting. Sometimes get it in by the second try, but last time took six attempts and really hard to pull down hard. Still better than trying to thread a regular needle. Occasionally need to use this. So I'm happy I don't have to fight with my eyesight to thread the needle. I found the needles a little hard to pull through to thread. 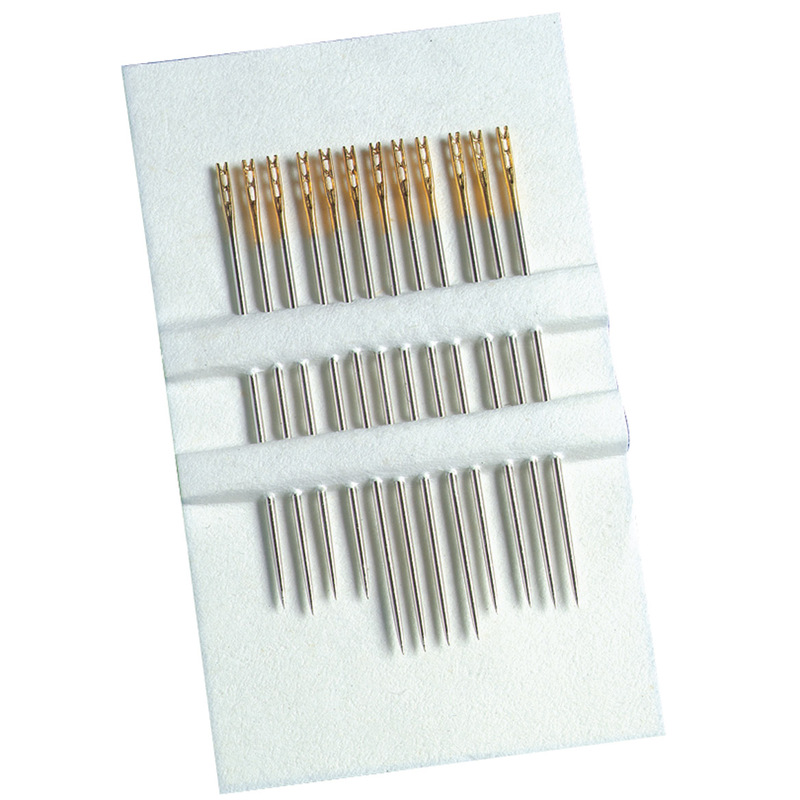 I do a lot of mending and when someone needs something sewn fast, this are the needles i rely on. Customers who have trouble threading a needle because of their eyesight will love them. So far I have enjoyed using them. I would not buy this product again. To small to thread properly. It is almost as hard to thread these needles as it is a regular needle. The needles do not work well with some types of thread. It tends to strip and knot the thread when trying to pull the thread into the slot. Been looking for these a long time, but not like they used to be. Tried spreading the slot at top and broke it off. Breaks the thread pulling it into the slot. I bought these a while back and tried three different ones. They ALL just broke the thread, so I gave up! The needles weren't easy to thread...it seems like there wasn't any opening. These work well for threading needles. I have used them in the past and WalterDrake is the only place I have found them available. As I gotten older I can;t thread the needle any more, so i'm hoping this will do the job it says it will. Purchased for a friend who has trouble threading needles to do mending. Having trouble with my eyes and I think this item will help. I cannot thread a regular needle. Grannie may find this useful. I don't want to depend on others to thread needles for me. I cant see well enough to thread a needle. It is easier than using a threader, I think. These looks so easy to thread. seen them on tv, and hoping they work as they say, i am legally blind and cannot thread a needle. Have a hard time seeing the eye of my needles when I am threading them. Eyes need help in tis endeavor. Hope this will be handy. Interesting needles, not expensive to try it. These ARE the most awesome needles ever!!! The only ones I use for all my hand sewing needs.... I am a crafter, seamstress, and quilter..... I say stock up because these are the absolute best! I had some of these once before, but guess I lost all of them. I like not having to strain my eyes to thread a needle. I have trouble threading a needle I thought this might help! I like thes needles, so I don't have to strain my eyes to thread regular needles. need to try something new, my eyesight isn't that of a 20yr old anymore yet I still enjoy sewing, I need needles I can thread, the threaders break so easily. To help my 97 year old aunt to thread a needle faster. She still loves to sew. My eyes aren't what they used to be. I can't seem to thread regular needles any more. These are great to help me with repairs. Eyesight not what it used to be. Have bifocals, but still hard to thread a needle. Thought I would try these. I am looking for a threader to help thread a sewing machine needle? BEST ANSWER: I don't believe this will work. These are needles for sewing by hand. They have a little notch at the top where you lay the thread over and just pull down. I love them. The needles I bought were all one size and too small for my hands to hold; I don't think they could were for threading a sewing machine. This won't help with the sewing machine needle. They are individual needles. Not intended to be used on the sewing machine. Good for hand sewing, don't know about sewing machines.